How much time is too long between posts? Well, six months is definitely too long! My last update was July 20, 2007 and here we are on January 26, 2008 and I haven't posted a single item in the preceding 6 months and 6 days. Nada. Zilch. Cero. It's not like things haven't been happening. The last 6 months were filled with just as much, if not more, excitement as the prior 6 months. I guess I was just too busy to slow down to type a quick little blurb. And that is too busy. The Mexico mission trip was a great experience, but it was definitely fatiguing, having just returned from my trip around the world with Patrick Calhoun of Christians Sharing Christ. I was one tired globe-trotter! On top of all that, the first part of August we got a report back from my dad's oncologist that the cancer had returned with a couple of "hot spots" in his upper abdomen and signs of cancer in his bone marrow. This was not good news ... at first. I'll admit that this threw me for a loop. Dad had already walked through the cancer treatments and every report had been good. This report came out of the blue. But during this process the Lord spoke to his heart to "expect the unexpected" and to be assured that God would get glory out of this. Sure enough, after repeated trips to Houston to take tests and get set for treatment at M.D. Anderson Cancer Center we got the report that the tests they ran in Houston showed absolutely no signs of cancer! We waited a bit to run the tests again and again, no signs of cancer!!! What a miracle - documented proof that God can, AND DOES, heal!!! We definitely got the unexpected!!! The rest of the year continued with quite a bit of busyness. On August 19 my precious wife and I celebrated our 20th wedding anniversary with a quick weekend trip to Houston where we got to worship with her dad and mom at Second Baptist Church. That was spiritually exhilerating! As we headed toward the end of the year things seemed to pick up pace. The church continued to grow with new people visiting every service. We improved our online streaming and saw more people visiting us that way. I taught a couple of series in November and December that really seemed to connect. In November it was "What Animal Planet Can Teach Us About Life" and in December it was "Old Carols in a New Light". 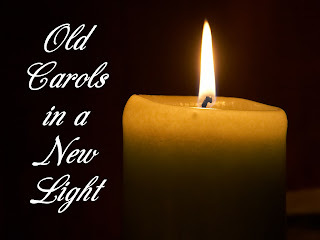 We looked at some of the beloved old Christmas Carols and examined their message. Sometimes we get so familiar with things we miss how awesome they are. We wrapped up the year with an incredible Christmas Eve service called "Carols and Communion by Candlelight". We had a New Year's Eve party up at the church where we watch "Flywheel" from the makers of "Facing the Giants". Then a couple of weeks later a bunch of us gathered at the church to watch LSU beat Ohio in the BCS Championship! That was a lot of excitement! 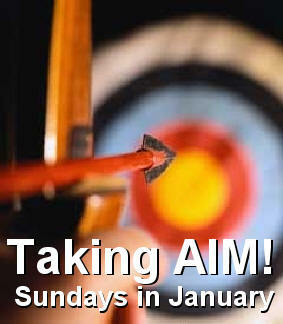 On top of that, I've been in a teaching series on Sundays that we'll wrap up tomorrow - it's called "Taking AIM" and we've been talking about not just shooting randomly at life but focusing on our target (goals), being intentional about changes and adjustments and measuring our progress. I believe it has helped us get off to a good start in the new year. Tomorrow is an exciting time as well. We will have our annual January church membership meeting when I will present the financial report for 2007 as well as individual giving records. We'll also be voting to confirm our Board of Directors and I'll be sharing about our vision for 2008. I believe that God has great things in store for the body of believers called Christian Challenge! I'm so excited to get to lead this incredible congregation into the future.